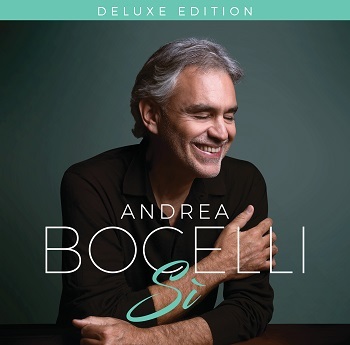 Andrea Bocelli’s Si Album is a spiritual gift for us all who desire to experience God’s expansive love down to the depths of who we are in Him, and who He is in us. With majestic vocals and a perfectly crafted symphony orchestra, this album shines a ray of God’s hope and sovereignty down from the Heavens right into the listener’s heart and soul. I believe the power of God’s sacred love and our potential in Him is the overarching theme of this album, with lovely vignettes of deeper meaning in each track and compositional score. After 14 years, this album pays tribute to the man Andrea Bocelli, his faith, life and family while exploring his classical favorites created centuries ago, composing them to his magnificent operatic singing voice. Celine Dion has said that “if God would have a singing voice, he must sound a lot like Andrea Bocelli”. By what I have experienced in his latest album, this rings true for me and I believe others can certainly be transformed by his music. The emotional depth of this album stands on its own. Andrea Bocelli’s God given gift of vocal expression and ability is unmatched. This album offers a way to listen and feel God’s love and tenderness in each beautiful composition in this album. I felt such incredible power in each song that with every teardrop of emotion, it opened my heart to new layers of discovery within myself. It was made clear to me that our God-given human emotions and our individual relationship with our Creator is where it begins and ends from our first cry to our final breath. Listening to each song with eyes closed, heart open, and spirit dancing, it illuminated God’s divine authority and created an incredible peace for my soul. The music drew me into a place of knowing how we are uniquely made for Him and that our idea of possible can be so finite compared to God’s idea of possible. Trusting how He is molding us and listening to the Holy Spirit can lift our sights to where only God can take us. This album showcases how God can use one man and his voice to transform our hearts to envision a more positive and loving world through music. This music elevates the senses to envision our dreams and the pure beauty of loving another deeply. I believe it can break the barrier of our thought patterns so we can soar like eagles and dance in God’s light in every detail of our lives. Andrea Bocelli’s voice allows the soul to blossom one petal at a time and to see vividly all the beauty within and around us for the greater good of humanity. These songs help us explore the depths of our imagination and of our limitless creativity that resides deep within waiting to be unleashed. It can elevate our spiritual vision to God’s intimate desire for us to know Him and seek Him. With my spirit soaring on each note, God’s all-encompassing presence filled every space of my soul with a profound knowing that only He could create these deep reservoirs of emotion for expression of the highest purpose – LOVE. Si, is certainly a Yes to each precious moment of life and love and to embrace it abundantly. It was a peaceful reassurance as my heart soaked up each powerful song, that God is in every valley and on every mountain of this earthly journey. He is the I AM, the Alpha and the Omega, the Trinity for us all – Father, Son and Holy Spirit. This album illuminates God’s Divine presence from the first song, Ali Di Liberta, to the last, with Ave Maria Pietas. The song, Gloria The Gift of Life, is about gratitude for life and the precious time we have on this earth. Gloria or God’s glory, the gospel, and the eternity we have in Heaven as Christ followers is an anthem for us all. This song is so emotionally commanding with the full chorus behind Bocelli’s voice that it opens my heart to complete surrender of who Jesus is and what He has done for me on the cross. As the chorus sings, “Alleluia, Alleluia”, my heart feels the sacredness of time and the moments we have to love generously for our King, Jesus Christ. The song, If Only, a powerful duet with Dua Lipa, conjures up for me God’s blessing of my own marriage and the deepening love for one another over the years, never taking one moment for granted. This duet reminds me that time is limited in this world, but the chemistry of true love can transcend time. As as she sings, “Don’t they say when you find love, keep it close. Treasure it like the sunset, like something more than gold.” All I can say is Amen. The father son duet, Fall on Me, to me, is about loving our children unconditionally, providing strong values as they discover themselves and always trusting God in the process of learning and listening to that still, small voice. Helping our children authentically find who they are and allowing them to fly, even stumble at times, is a part of this delicate process of our parent child relationship. Having our children fall on us during their challenges and to gently provide answers allows them to soar to new heights and be who God is calling them to be. This duet is absolutely breathtaking and a beautiful reminder of this privilege we have as parents. Each song arrangement is uniquely different in style and provides a new backdrop for our listening enjoyment. It felt as if I could wrap myself in Bocelli’s voice and let God light my path down a slow road of introspection, reflection, prayer, stillness, romantic love, virtue, optimism, and a place for the heart and soul to reclaim their space together in perfect union. His music is a beautiful way to slow down, to savor sweet memories and a way to delight in the simple pleasures of life. Within each season and turning leaf of time, we are to dream of a brighter tomorrow. Slowing down and loving those around us by honoring who they are is such a sweet gift of fellowship, within our homes and communities. Our culture doesn’t often want us to remember what God gives us at our fingertips each and every day in way of soft touches, gentle expressions, listening openly and space to BE in the presence of Him and each other. Andrea Bocelli’s music gives us an inspiring landscape to rediscover what is precious and linger in those loving spaces. May your hearts dance gracefully and tenderly as you feel Andrea Bocelli’s raw emotional notes of expression for his love of God, his marriage, his family and for every searching soul in need of refuge. The english translation to the music is poetry at its finest and offered another layer of depth for me to immerse myself in each word and meaning. Therefore, I will leave you with some of the words to the english translation of his first song, Ali Di Liberta, Wings of Freedom. God Bless Andrea Bocelli and a sincere thank you to his art form of transcending our thoughts through his music to elevations closer to God. 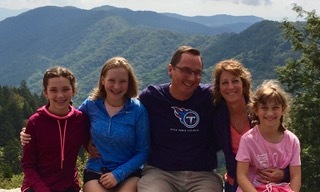 Tiﬀany currently lives in Tennessee with her husband and their three daughters (ages 14, 12 and 8 yrs). When Tiﬀany is not spending time with her husband and girls, she enjoys exercising, walking in nature, cooking healthy recipes in her kitchen, listening to music, writing, studying God’s Word and reading wellness books. She and her family attend Immanuel Baptist Church.